Named for the shape of its frame, the Baker “A” Band Resaw is great for all of your resawing needs. You'll cut at speeds not possible on many band resaws costing much more. Accuracy, dependability, economy, simplicity, versatility, and low maintenance are combined into one affordable resaw. Resaw everything on it, or use it for short runs. Use it to cut boards or cants, or reclaim slabs. The Baker “A” fits in a 3/4 ton short-bed pick-up, so load it up and take it with you. Accuracy, dependability, economy, simplicity, versatility, and low maintenance are combined into one affordable resaw. 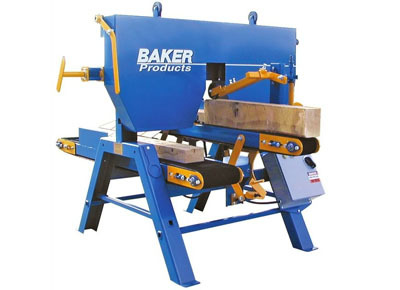 That is why the Baker “A” is the most popular band resaw in the world.